Durlston is a spectacular place for geology. 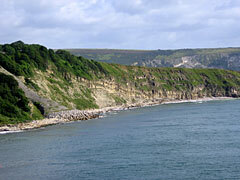 The rocks within Durlston Bay provide the best record through the late Jurassic and early Cretaceous periods (140 to 130 million years ago) in Britain. 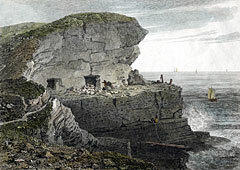 The oldest rocks, the Portland Limestone, form the headland and were laid down in a shallow sea. Above them lie the famous Purbeck Beds, formed in shallow lagoons and swamps surrounded by arid salt flats. Dinosaurs walked across this ancient landscape, leaving behind their footprints. The rocks are world-famous for fossils, but many are strange or minute. Durlston Bay is the best source of reptiles and mammals of this age anywhere in the world! 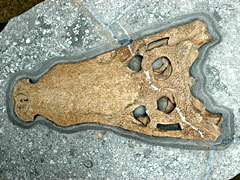 The fossils include turtles, crocodiles, lizards, flying reptiles together with the dinosaur footprints. The mammal fossils are tiny but none the less important. Some eighteen species have been described from tiny bone fragments and teeth. Following the eras of deposition, huge movements of the Earth's surface and the collision of tectonic plates resulted in the formation of the Purbeck Anticline. The local rock strata were folded into an arch shape, tilting away from the horizontal, as evidenced in Durlston Bay. The end of the Ice Ages, (the last one 10,000 years ago), resulted in rising sea levels, and the consequent erosion led to the formation of the coastline we see today. 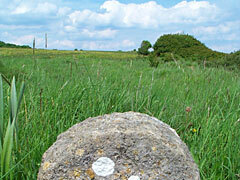 Durlston has a long history of human influence, possibly going back to the Stone Age. However, although the name Durlston is thought to be derived from the Saxon, there is no direct evidence of human activity until the agricultural systems of the Medieval period. The early farmers probably cleared much of the original woodland from the site for their crops and animals, and began the transition to the open grassland landscape which we find today. Quarrying has been carried out in Purbeck since Roman times, and the Purbeck stone industry probably reached a peak around 1800. The Durlston landscape still shows the characteristic 'humps and hollows' produced by the mine shafts and spoil heaps (known as scarbanks). Portland Stone was quarried from cliff quarries such as Tilly Whim 'caves', which closed early in 19th Century, following fall in demand. Other historical features in the Durlston landscape include the remains of a Napoleonic-era telegraph station on the top of Round Down which had been erected around 1795. The area was farmed and quarried for centuries and, even as late as 1840, a considerable amount of the Medieval strip systems still existed. Much of the area was open sheep pasture but crops were grown in the enclosed fields. Fired by a Victorian zeal for learning and the natural world, George Burt set about transforming the rest of his estate. 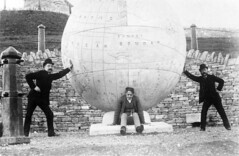 The most spectacular of his many creations was the Great Globe. 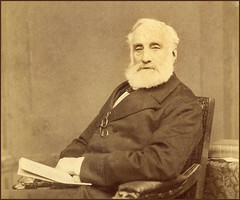 George Burt's developments were not confined to building work. His estate was landscaped and planted with a variety of plants from around the world and it is worth noting that 50 men were employed to maintain Burt's ' New Elysian landscape'. The Victorian era was also a great age of fossil collecting. 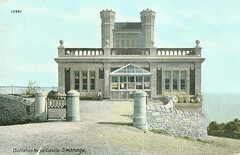 Durlston Bay, already famous for its geology, attracted the interest of W.R. Brodie whose initial finds in 1854 led to the large scale excavations by Samuel Beckles in 1857. According to the London Illustrated News he found ' 27 species of marsupial mammal about 16 of which are totally new to science'. During the thirties, several English artists took inspiration from Durlston, and Shell, under their manager Jack Beddington, proved enthusiastic patrons: Graham Sutherland illustrated the Great Globe in a 1932 Shell advertising poster. The Second World War saw further developments at Durlston: an ‘OBOE’ radar station (RAF Tilly Whim) was established to act as part of the system for guiding pathfinder bombers. RAF Durlston Head was added in 1944. After the war, the RAF huts were used for emergency housing and up to 24 families lived here in until 1954. The huts were finally demolished in 1974. The Park was created in 1973. The first Warden, Ron Skipworth was appointed in 1974 and the Visitor Centre was built in 1975. Since then 30+ years of careful management, have seen Durlston retain its natural assets, while offering ever improving facilities for visitors.